Merry Christmas, here we are again, with a government shutdown. A whole bunch of Americans are supposed to report for work, even though they won’t get paid, at least until congress does their job. Being elected in America needs to have some kind of checks and balances- and it’s pretty clear, elections aren’t what they used to be as a check and balance, because we have the best politicians money can buy. 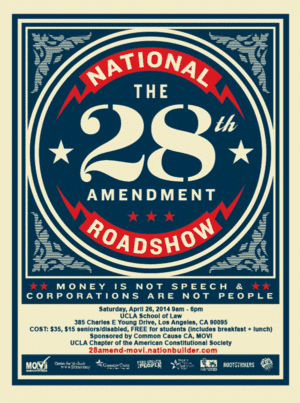 There are plenty of other proposed 28th Amendments if you do a search, but, to illustrate this article I just picked the coolest poster out there that I could find. If the elected members of federal office fail to keep the government operating, they are immediately fired, and the person who last ran against them and came in 2nd, takes their place. They are then banned from ever holding public office again, and all benefits, including pensions, social security, medicare, etc. – the things that they held hostage for their lack of compromise, are stripped from them. Any money left in their campaign fund, is turned into the federal government to help reduce the deficit. If a member of their own party won, by beating them in the primary and being elected, they may ascend to office. If they didn’t run and a member of their own party was elected, it goes to the person who had the second most votes. Any supreme court nominations that took place during the last 2 years, will be nullified and the new president and congress will choose the replacements. This should end this nonsense of government shutdowns once and for all. Now, the question is, are we better off with President Hilary Clinton, and Jim Renaci and Ted Strickland for senators, and Theresa Gasper as our Congresswoman? Say goodbye to Neil Gorsuch and Brett Kavanaugh too. It may seem drastic, but, with those kinds of penalties, the insanity would stop. Next Post: Have you been trashed by the Dayton Daily news? How about the opposite? Until the government is back up and running with a budget, nobody leaves the building. Congressmen, senators, the president are all locked in their respective places of business. Guards at every possible point of egress. Make it clear in the amendment language that leaving the building (except in a grave emergency) is the same as immediately resigning. If they need cots and sleeping bags, bring ‘em in….whatever our troops get will be just fine. MREs will be provided. Laundry and showers, too. Bring in MDs if required. We sequester juries all the time, why not politicians? The government will be back up and running in no time.